A poster on the Pyrenees thread today said he learnt to ski *before* snowbashers. Anyone here do the same? It would probably be the period from the 1840s up to the 1970s. Any cool tales out there? Most of my local smaller ski areas aren't groomed. Which makes sense with NZ being at least 50 years behind the rest of the world in most things. Just avoid if icy. Otherwise all good. with the main exception being rugby!!! Both pics show the PB out in the daytime. This invokes fond memories of having to watch out for these on the pistes. Nowadays in much of the PdS they do their doings under shadow of night, and is a rarity to see them strutting their stuff by day. I love spotting the lights as they go up and down through the trees opposite our place in Les Carroz at night. Took me years to realise that they use a cable to haul them up and down the really steep slopes They have an open day in the summer when you can go in and look at them up close. Would not want to ski anywhere near one of those big beasts. I skied in Scotland from ~1974 up until around 1990 ... there was not so much piste bashing done. In fact, I did 3 PdS seasons 1989/90/91 and many slopes esp. red and black were at best infrequently bashed. Made for better skiers, as did long skinny skis!! I can remember ski areas advertising the fact that all their pistes were bashed every night. Espace Killy make a selling point of 'Naturide' pistes, that are not bashed. I'm fairly sure that the Lecht got the first piste basher in Scotland. 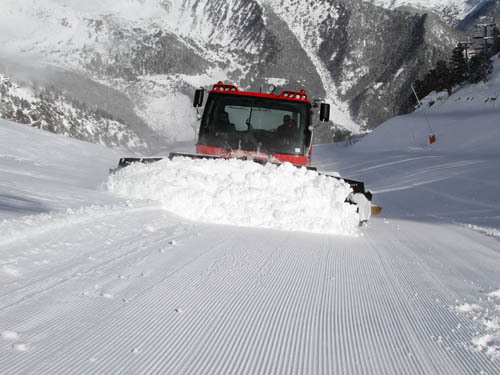 20 Bods stamping down the side of Mount Olympus to make a steeper section of Piste for the Inter-Services Championship.. Continuing on from Albob, Frith Finlayson talks about side stepping a hill all day to create a piste. The event... The Swiss Ski School directors course 1959/60. I think it was Davos so no early machines around then. FF, one of the founders of BASI. @terrygasson, I thought Rugby was quite a nice place. Naturist pistes, could be popular but chilly. I did a lot of my early learning in Scotland: not wholly unpisted but far from courderoy, generally rough under ski. Mr G also learn to board there. It teaches you a great many positive things, I think: balance, relaxation and not to fear uneven-ness, bumps and varying depths amongst them. Still ski Scotland and England; again, some might be PB'd but not to European/Alpine standards. But there's always been piste bashers! Human ones!!! As more people exited the lift, they ski down the same route. Eventually, the piste got "bashed". You can sometimes see that effect in the "access" part of popular off-piste routes that got a lot of traffic. ... You can sometimes see that effect in the "access" part of popular off-piste routes that got a lot of traffic. Anywhere you ride at a resort suffers from that - "resort powder" is good, but there's always a skier-pisted base down there, which you don't get if you go further afield. @Rogerdodger, used to, as a child, have my boots rented for me from Mr Finlayson, a gentleman. I have skied now and again with an ESF guy in Tignes (Louis) who is now in his late 70s. He told me of when he started his career as a young pisteur. To groom the piste he and all the other pisteurs would start at the top of the slope and stand across it in a line with their skis all tip to tail, and steadily tramp down it. If you want to see some footage from even earlier days of skiing, track down the film "Der Weisse Rausch" (Arnold Fanck). It's on DVD and may still be on YouTube with Italian subtitles. Forget the corny story line but enjoy the skiing shots, filmed in the winter of 1929/30 (exactly the time my old mum was born, bless). @bobski62, somewhat would have thought they’d side slip mind you that would scrape off snow. Surprised they’d bother at all. When I was ski-bumming in Colorado in '87 you could join a group at any of the Summit County bottom stations at 8am, and be taken up by ski patrol to spend 2 hours "boot-packing" (although with skis on) black runs, after which they handed you a day-pass! Presumably winch-grooming and liability fears have put paid to that . Anyone familiar with using rope rows will probably have experience of flattening the snow manually either be stamping or rows of snowplough skiers. Lots of areas still don’t use piste bashers eg Raise and Allendale. @Peter S, is "Allendale" a ski resort? To be seen when students are in resort. Reminds me of Apocalypse Snow... but much better. Skillful skiing and cinematography, without a modern ski or gopro in sight! "Liberate la Pista!!" -- stop the brutal grooming.....! My first skiing was on a school trip in the early 60s. Ungroomed slopes on wooden skis. Rope tow. Great Film....what is interesting, is they did not use a Pole Plant to help with the Christie turns. I wonder when that came into being? My first Bronze Badge was awarded at Saas Fee in 1972....and looked very like that triangular symbol at the end of the film. Nowt wrong with T-bars (unless you've got a bit of a "stout" build and are sharing the T-bar with another similarly built snowHead ), ain't that right Frosty the Snowman? Great fun to be had following behind a piste basher laying fresh tracks at two in the afternoon. Like having your own magic carpet rolling out in front of you. Don't you keep running into the back of it? I think I was the one who mentioned the ski-ing pre-bashers. Yes, it was the 1970s. As well as the rutted ice, then slush every day (unless it snowed), the other thing was that moguls were never smoothed out, so anything of moderate steepenss or more got very moguly, until it next snowed, when there were moguls covered in powder. Also, drag lifts got very rutted, which then froze overnight, making them quite fun the next morning. Plus the old skis, boots, bindings etc, but that's another story. Folk these days don't know they're born! And yet there were people who could shred it in those awful conditions, in that gear. Impressive. I saw a clip of Didier Cuche wearing period clothes and gear, I believe the day after he retired. He was on the race course, and the best skier in the world or thereabouts could barely keep his feet. Doubtless the skating rink race course had plenty to do with that, but still it is baffling how they turned those things. Then there's rope tows....I miss rope tows, said no one!